As another year comes to a close we will see the usual back and forth commentary about the cost of fireworks displays in all the major cities of the world to herald in the New Year. The largest display in Australia is put on in and around Sydney Harbour with approximately seven tonnes of fireworks launched. 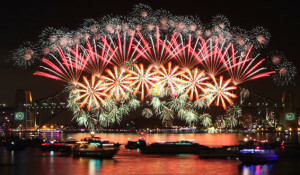 It is estimated that 1.6 million people watch the fireworks at vantage points around the harbour, a further 2.3 million people watch them from their homes across Australia and 1.1 billion people around the world also tune in to see the spectacle (I am curious as to how anyone can actually track this latter figure though). The bill for this thirty minute light show comes in at around $6.5 million which as the Lord Mayor of Sydney points out equates to $4 for every person who gathers around the harbour. Now of course $6.5 million is a fair bit of money and it could be used to upgrade a hospital, feed the homeless or support our brothers and sisters in developing nations, many of whom are surviving on a dollar a day. On face value, fireworks can seem an unnecessary and even selfish expense, especially when so many of the young people watching them end up drinking themselves silly and have to be pulled out of the gutter by friends or the police in the early hours of the morning. Fireworks do not feed the hungry, cloth the naked or teach the ignorant; they provide no genuine service to the physical needs of any person, (except perhaps towards the livelihoods of those who create them). What fireworks do demonstrate however is man’s need for more than just food, water and shelter. In some sense our desire to come together at such large community events and mark the end of one period of time and the start of another shows the spiritual nature of the human person. Yes we all have certain physical needs and governments around the globe work to varying levels of success to achieve these goods for their people but we have other needs as well. We have the need to be connected to others; to know that we are not alone on the journey through life. We have the need to experience joy; to realise that amongst the wars and poverty and disease we can still acknowledge that there is good in the world. And perhaps most importantly we have the need to experience hope; to know that even with all our personal, national and global struggles we look to the coming year as a fresh beginning. Even if it lasts no longer than a few days, New Years Eve celebrations offer us the opportunity to lift our heads, acknowledge the time that was and look with optimism to what might be. There are not many times left when secular governments invest money in the spiritual needs of its people but the New Years Eve fireworks are one of those times. This need for the spiritual is perhaps more evident in the churches and cathedrals whose spires can be seen dotted between skyscrapers in our cities, or, in museums with beautiful works of art from across the ages. Animals have no need of beauty but man in not only an animal; he is a spiritual being who yearns for those transcendental realties of truth, beauty and goodness. If there is poverty in the modern Western world, it does not come from a lack of physical needs but a distinct lack of transcendence. If Christianity sold off all its churches and museums sold off all the beautiful objects that they hold, then it is true that a whole lot of people could be fed today. But what would happen tomorrow? They would be hungry again and on top of there being no food, there would be no signs left to remind them of the goodness of the world and that they are capable of a reality beyond themselves. Similarly, we could cancel the New Years Eve fireworks this year and divert the funds into a physical and more practical project but where would people gather to process the year that was? Where would they gather to look towards what could be? Fireworks are more than just colourful explosions; they are really a sign of man’s search for something greater than himself and without that man descends rapidly to little more than an animal. Wishing you all greetings for a Happy New Year.